Video from the 2016 Hohonu Moana: Exploring Deep Waters off Hawaiʻi expedition; courtesy of the NOAA Office of Ocean Exploration and Research. Download larger version (mp4, 16.6 MB). One million square kilometers. Sounds like a pretty big area, doesn’t it? It is! 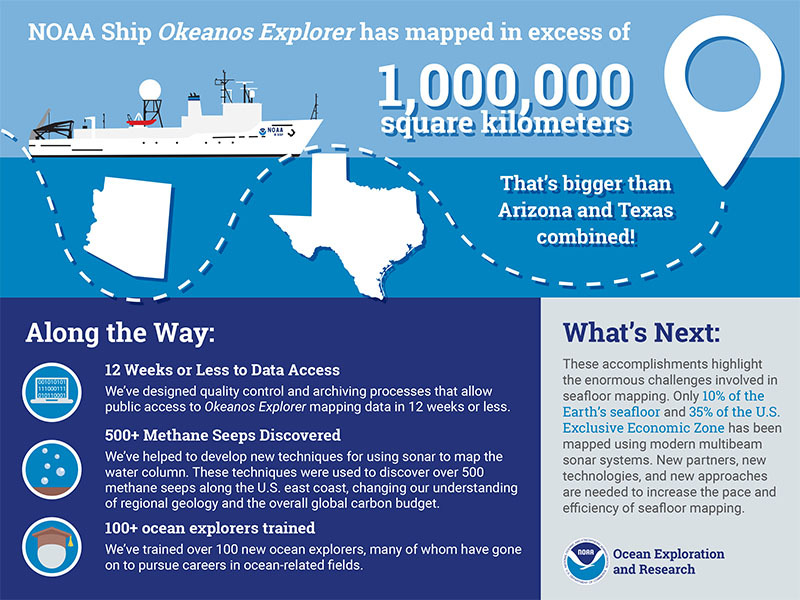 In early 2014, NOAA Ship Okeanos Explorer surpassed having mapped 1,000,000 square kilometers of the seafloor using high-resolution multibeam sonar. For perspective, one million square kilometers is bigger than the areas of Texas and Arizona combined. While we do have low-resolution maps of the ocean floor derived from satellite altimetry data, these maps only give us an overall general picture of what’s down there. They offer limited detail of the seafloor and can omit things like seamounts, volcanic craters, or shipwrecks. The coverage of high-resolution seafloor data, such as that collected by the Okeanos Explorer, is very limited in the deep sea. Yet having a comprehensive visual of the seafloor is critical to understanding, managing, and protecting our planet. Over the last eight years of mapping the seafloor, the Okeanos team has contributed critical ocean science datasets for many of our world’s ocean basins. In the process of mapping 1,000,000 square kilometers, the Okeanos multibeam sonar revealed numerous geologic features, including seamounts, trenches, ridges, wrecks, and banks that had previously been unknown or incorrectly characterized. Detailed seafloor maps, such as those generated from high-resolution multibeam data, are also essential for exploration and baseline characterization of the ocean environment. The data collected by the Okeanos has been essential in better planning subsequent research and exploration missions on the Okeanos and partner vessels. 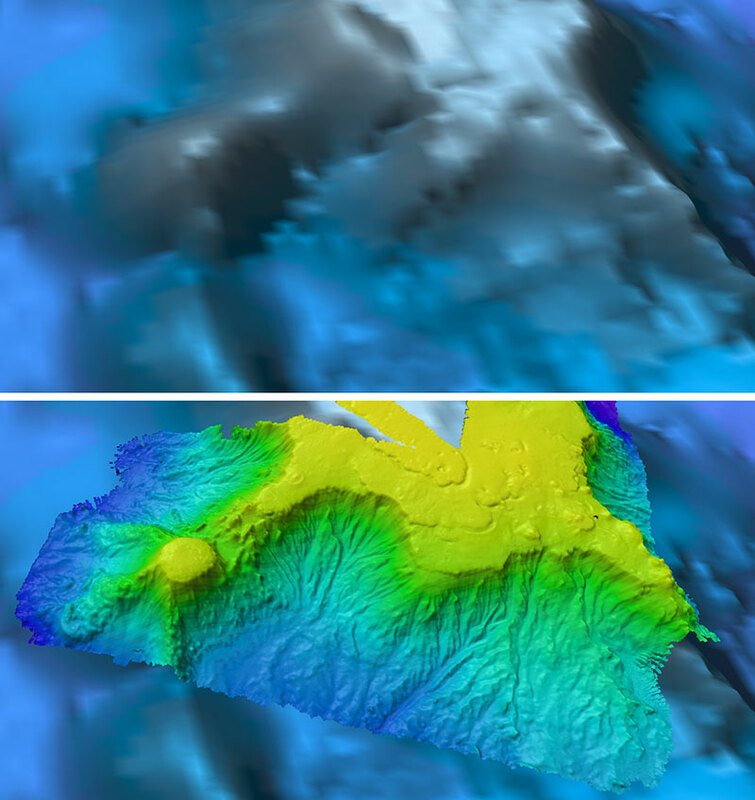 Comparison of resolution of satellite-derived bathymetry (top) and multibeam sonar bathymetry collected by the Okeanos Explorer (bottom). Example shown is the largest seamount in the Wake Atoll Unit of the Pacific Remote Islands Marine National Monument. Image courtesy of the NOAA Office of Ocean Exploration and Research. Download larger version (jpg, 635 KB). Designing a quality control and archiving process that enables easy public access to Okeanos Explorer mapping data in 12 weeks or less after the expedition. In fact, the average time to archive Okeanos mapping data is just 42 days, compared to other research cruises, which can take two years or more. Helping to refine new techniques for using sonar to identify bubble plumes in the water column emanating from the seafloor. These techniques were used to discover over 500 new methane seeps along the east coast of the United States, changing our understanding of the geology of the region and the contribution of continental margins to the global ocean carbon budget. Training over 100 young ocean explorers in deepwater seafloor mapping, many of whom have gone on to pursue careers in ocean-related fields. Given that only about 10 percent of the entire planet’s seafloor has been mapped at high resolution, it makes the Okeanos’ “one-million” mark that much more significant. However, when you consider that the ocean covers 335,258,000 square kilometers, it makes you realize just how much further we have to go to fully understand this dynamic planet. We’re just getting started, and new partners, new technologies, and new approaches will be fundamental to increasing the pace and efficiency of seafloor mapping. Image courtesy of the NOAA Office of Ocean Exploration and Research. Download infographic (pdf, 186 KB). 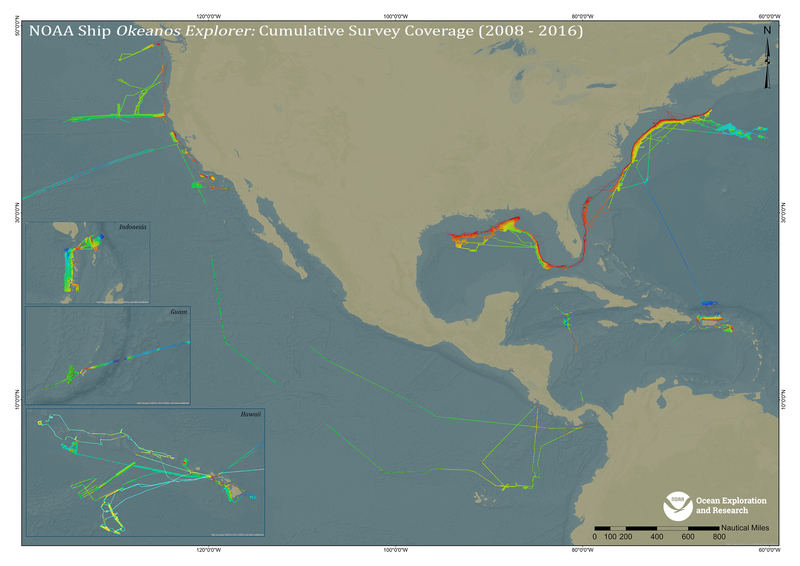 Map showing Okeanos Explorer cumulative multibeam survey coverage from 2008 through January 2016. Image courtesy of the NOAA Office of Ocean Exploration and Research. Download larger version (jpg, 2.6 MB). This knoll is located on the flank of a larger seamount in the eastern Pacific Ocean about 200 miles off the Costa Rican coast in 2,500 meters of water. 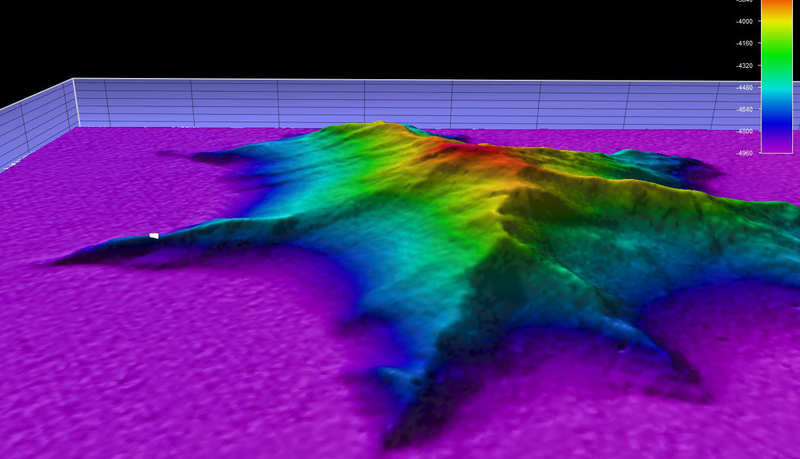 The feature, which rises 500 meters above the surrounding seafloor, was mapped using multibeam sonar during the Tropical Exploration 2015 expedition. Prior to being mapped by the Okeanos Explorer, the knoll was an poorly distinguished feature on a gravity anomaly map derived by satellite altimetry. Image courtesy of the NOAA Office of Ocean Exploration and Research, Tropical Exploration 2015. Download larger version (jpg, 104 KB). 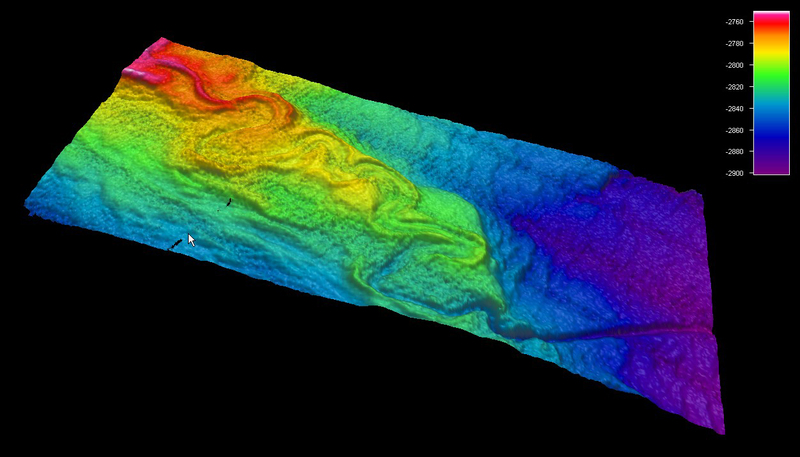 Image of an underwater river feature on the seafloor in the Northern Gulf of Mexico, mapped during the Gulf of Mexico 2012 expedition. Colors indicate depth. Image courtesy of the NOAA Office of Ocean Exploration and Research, Gulf of Mexico 2012. Download larger version (jpg, 384 KB). 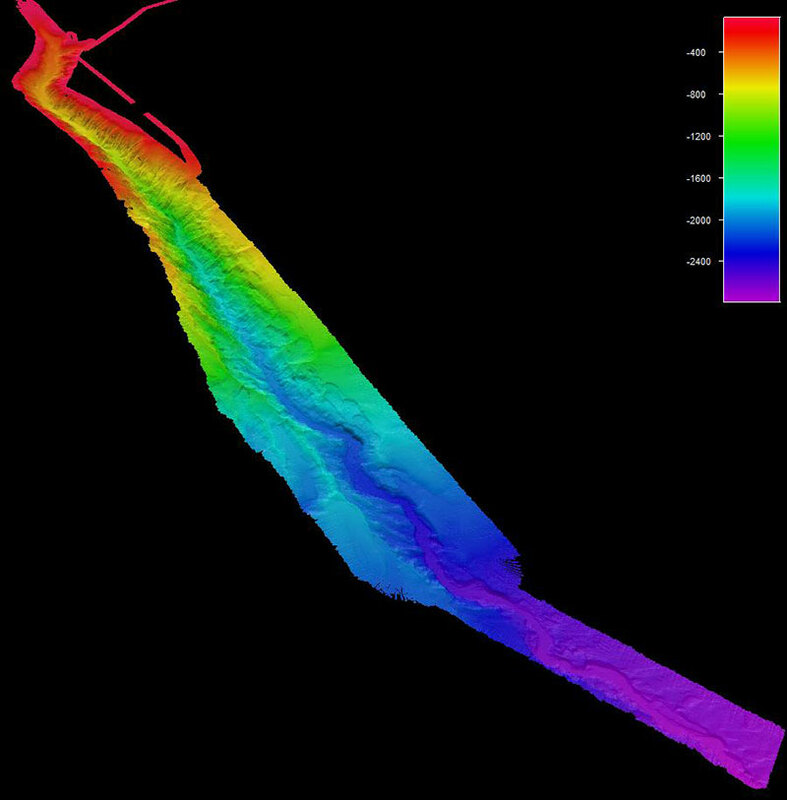 Image of bathymetric data of Hudson Canyon, located 85 nautical miles east of New York City. Hudson Canyon, which is at its widest point is over five nautical miles wide and stretches over 100 nautical miles eastward into the Atlantic Ocean, is one of dozens of canyons mapped by NOAA Ship Okeanos Explorer on the U.S. Atlantic coast at part of the multi-year, multi-vessel Atlantic Canyons Undersea Mapping Expeditions (ACUMEN) campaign. Image courtesy of the NOAA Office of Ocean Exploration and Research. Download larger version (jpg, 218 KB). This image shows a side view, two-times vertical exaggeration, of the unnamed seamount we explored during Dive 10 of the Exploring Atlantic Canyons and Seamounts 2014 expedition. The white dot represents the point where remotely operated vehicle Deep Discoverer was deployed. Image courtesy of the NOAA Office of Ocean Exploration and Research, Our Deepwater Backyard: Exploring Atlantic Canyons and Seamounts. Download larger version (jpg, 426 KB).